NewHOST Review 2019: Is NewHOST a Good Hosting? NewHOST is a medium-sized hosting company that’s been in operation for more than 20 years. They provide stable shared cloud hosting, business hosting, dedicated servers, VPS, and colocation services with dedicated support and ironclad SLAs to over 20,000 customers. Since 1997, Romanian web hosting company NewHOST has powered 27,500 websites around the world. They offer shared cloud hosting, business hosting, VPS, Cloud IaaS, and reseller hosting solutions along with value-added services such as web design at fair prices. 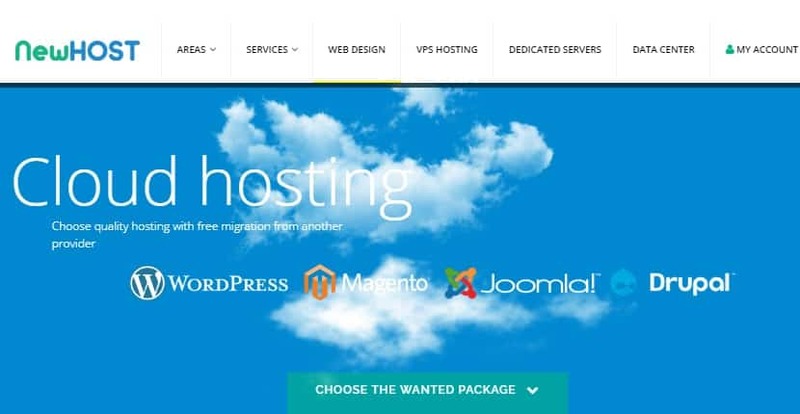 Their shared hosting services are their most popular. The Start Plan — their entry-level plan — comes with one dedicated IP address, 2GB SSD storage, one MySQL database, and a single mailbox. This plan is suitable for individuals hosting a website with fewer than 10,000 visitors. Their Advanced Plan is more suited for hosting forums, business websites, or community websites: with it, you get 5GB SSD storage, five mailboxes, and five databases. It can easily handle up to 30,000 visitors per month. Their Complete Plan, on the other hand, is great for any business website or e-store and can handle up to 60,000 visitors every month. All their shared hosting plans are on a cloud infrastructure, which means better reliability and overall uptime compared to those of more standard shared hosting providers. NewHOST also offers enterprise-grade Intel Xeon dedicated servers with full root access. If you’d rather go for a happy medium between dedicated servers and shared hosting, you’ve also got either OpenVZ or KVM-virtualized virtual servers available. These come with a 100% uptime guarantee and the best possible security. With regards to pricing, I can say NewHOST’s plans are quite affordable. Their starter hosting packages also come with more features than you’d typically get elsewhere at the same prices. Upgrading is easy and allows you to unlock more storage, RAM, and bandwidth for your websites. Though a 19% VAT surcharge is included in their plans, they don’t charge you any setup fees. NewHOST provides 24/7 technical support to customers. However, this is primarily through email and tickets: their phone support is only available during business hours. Their customer support is effective and friendly regardless of whether you’re a beginner or more experienced webmaster. When I contacted them, they deftly walked me through the necessary steps to resolve my issues, and got everything sorted out within the hour. NewHOST is a fast-growing hosting company with a range of hosting solutions that can put your business on the map in Romania and beyond. Wondering how NewHOST stacks up against other Web Hosting companies? Enter any other Web Hosting company and we will give you a side-by-side comparison.